Going for a vacation can be a refreshing moment for you and your family. The refreshing benefits include taking a break from work and even enhancing the health of your family. 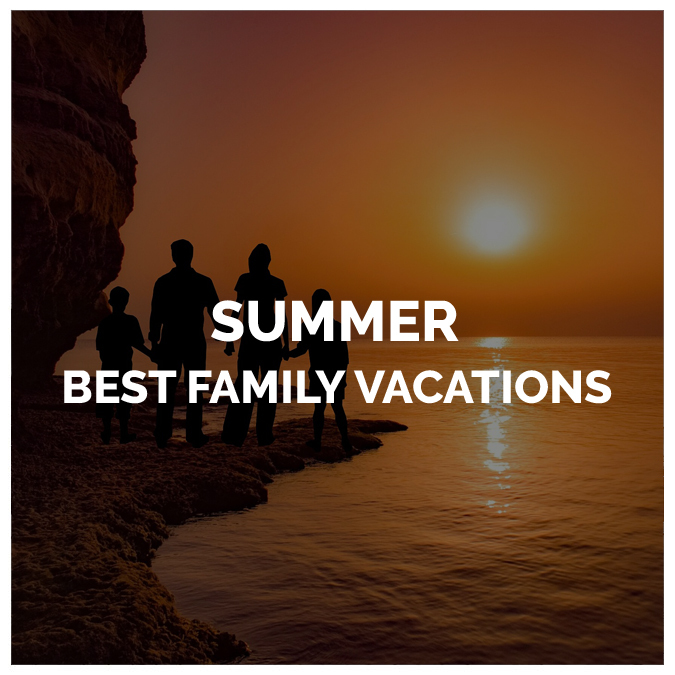 Best of all, vacation provides a great time for the entire family to get together and bond. It’s also a great fun time for the entire family to tour another part of the world. Keep reading to find great tips for best summer family vacations. Indeed, everyone wants to maximize their summer vacation. That’s what this article is all about, providing you with helpful tips and ideas on how to enjoy the best summer family vacations to the fullest. One of the best ways to experience the best summer family vacations is to brainstorm on your interest as a family. In essence, what are the activities or fun things you love doing together as a family? For instance, do you want to go on hikes as a family or just visit historical places? Do you prefer to have the kids come up with their preferred activities and let the adults brainstorm on their own fun activities while on summer vacation? Going to the Beach: You don’t need to be told how hot the weather can get during summer. One of the best summer family vacations activities is to visit the beach and cool off. Besides, the beach offers a number of fun activities for the family such as playing in the beach, plus the kids will be entertained for hours as they watch the rolling waves. Hiking on the Mountains: If you have a family that enjoys nature sites, hiking out on the mountains during summer can be a fun activity but tiring anyway (as the sun saps energy). A Visit to Historical Sites: Often, both adults and kids love to visit historical places to experience inspiring architecture and museums. In this case, visiting a city will provide a great family vacation experience. Go to the Lake: A lake is also a great place to be during a family summer vacation, and especially in a somewhat landlocked destination. In the course of your visit to the lake, the kids can learn to use a kayak or canoe, while at the same time savoring the stunning and calming scenery. Enjoy a Cruise: Cruise often offers lots of fun activities targeted at the family, making it a great idea to experience the best summer family vacations. Finance is always a big factor when planning family vacations, which is why you should define your budget as early as possible. In fact, your budget will influence your choice of family vacation destination and fun things to do. Accommodation: Often, people prefer to lodge in a hotel while on vacation. However, if your family is large, you should consider other options (especially if your budget is low) such as renting a house, using a cabin or condo. Bear in mind that you can land great deal by going for all-inclusive family vacation package. Transportation: First, the price of air ticket for each member of the family is a great priority. Luckily, you can find huge discount for family vacation air tickets. Also, you should factor in transportation cost in terms of getting around when you arrive your destination. For instance, do you prefer to get around with train, bus, taxi or rent a car? Entertainment: Entertainment is a major aspect of your budget when planning a family holiday. So, you should factor in the cost of paid entertainments (e.g. concerts, shows, visiting amusement parks) for the family. You should plan your best summer family vacations based on your budget. For instance, if you’re on a tight budget, you should consider taking your family to a popular destination (since it is cheaper to travel to such places). The places you may want to avoid during summer are locations in the northern hemisphere, especially during summer. However, if finance is no issue, go ahead and make your choice of vacation destination accordingly. The truth is that you can have a fulfilling and fun-filled family vacation whether or not your budget is so robust. it only requires careful planning and research. Finally, as you plan the best summer family vacations, you should remember the logistics aspects – getting the passports for every member of the family ready, as well as other documents and items required for the trip. Also, start early to plan and make your booking. Early planning comes with tons of benefits that include not missing out on any important preparation. I like your advice to create a budget that includes everything, such as the price of the condo or cabin rental you want as well as transportation. When doing this, you might want to figure out where you want to go so you can research local accommodations to get an idea of the cost. While doing this, it would probably be a good idea to make sure that the cabin or hotel can fit the number of people in your group, such as if you’re going with family members or just with your spouse, so you can live comfortably in the space for the duration of your trip. Great Stuff! It’s really awesome resource about travel plan. This is an AWESOME guide. Thank you!